Summary: When Dr. Glockenspiel escapes from his cell and demands one billion, trillion dollars, even the top secret agents prove ineffective. 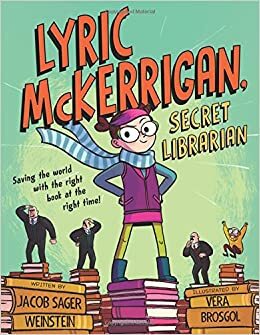 Glockenspiel threatens to unleash giant moths to eat the world’s books if his demands aren’t met, so it’s up to Lyric McKerrigan, secret librarian, to parachute in to the rescue. Posing as a custodian, a plumber, and a prison warden, McKerrigan surreptitiously matches the right books up with the people around Glockenspiel. Not only does she bring them to her side, but when the giant moths are released, she tames them with a story. They turn their attention from books to the doctor’s woolly sweater, and he ends up shivering in his underwear before heading back to jail, a large red “Returned” stamped on his forehead. 48 pages; ages 4-8. Pros: Sometimes books with a pro-book, librarian hero(ine) message can sound a little desperate, but this one is pretty funny. Lyric has some good disguises, and the message that there’s a book for everyone is delivered with a light touch. Kids will enjoy the cartoon-style illustrations. Cons: Lyric is a bit stereotypical, with her glasses, hair in two buns, and shown reading with her cat and a cup of tea on the last page.